Karl Marx was born in Berlin where he studied law; he soon became a revolutionary communist and started his friendship with Frederick Engels creating the ‘Communist Manifesto’ which was published in 1848. Marx most famous work ‘Das Kapital’ openly shares his beliefs in communism ,the first volume described as the ‘bible of working class’ depicts Marx’s judgements on all aspects of society all include the mass conflict between the bourgeoisie and proletariat in society. This statue is located off Under der liden, in east Berlin near the Spree river, these are surrounded by smaller statues based on socialism depicting historic scenes designed by Ludqig Engelhardt. Marx and Engels considered the founding fathers of socialism. The location is also near Nikolaviertel which was rebuilt, the GDR did establish plans to rebuild the area in the green space where the statue is located however after the war the area was heavily bombed and no further construction plans were put in place. 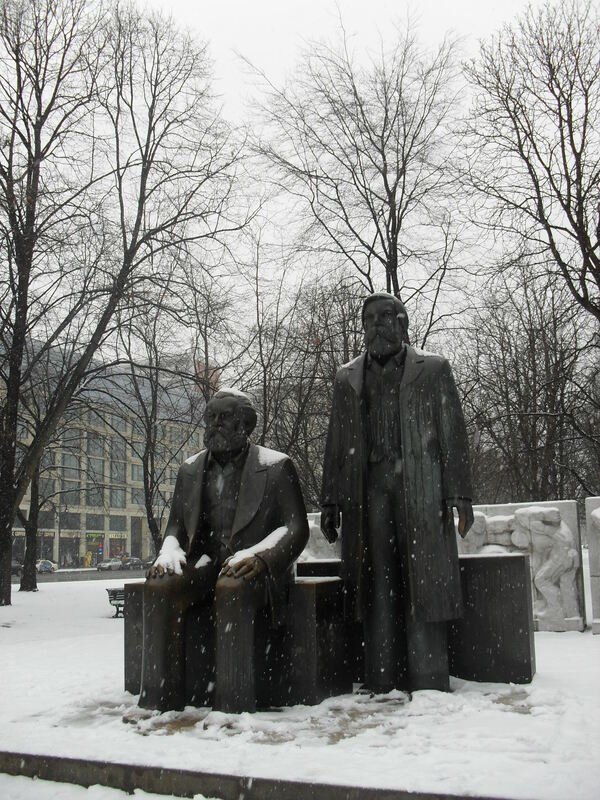 After the reunification of Germany Marx’s statue caused some controversy and Berliners wanted the statue removed as it was seen as an ‘unwanted relic’, however the majority felt that it should be preserved as kept due to its historical significance. 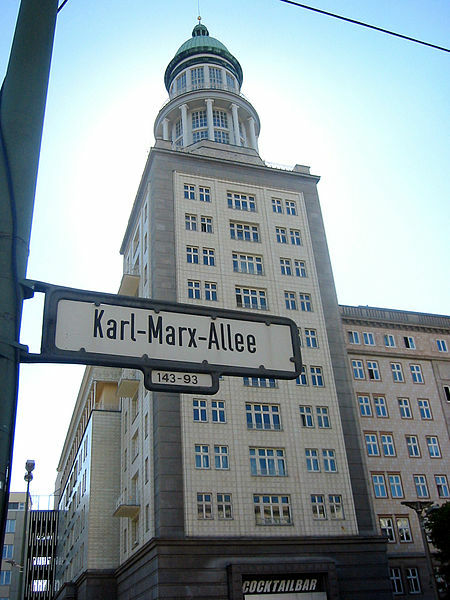 Marx influences on Berlin is still remember in some form, firstly this statue in the east and secondly Karl Marx Allee. 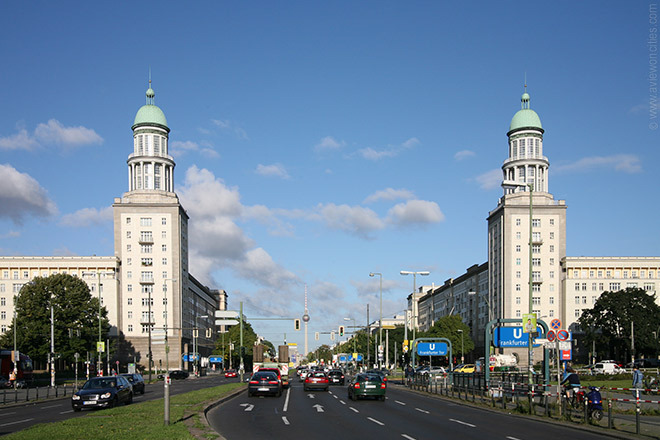 The boulevard was rebuilt after World War 2 by the GDR, the boulevard is nearly 2km long, the architecture features 8 story buildings in the 1950’s ‘wedding cake’ style designed by the soviet union with two towers at either end of the street; Franktor and Strausberger Platz however the boulevard does feature typical GDR architecture. The boulevard was previously named ‘ stanlin allee’ after Stalin death in 1961 it was renamed after the Karl Marx. It was once the main location for shopping as developed by the GDR. Fredrick Engels one of founders and major contributors to the foundation of modern communism writing many books about how communism should be applied to society and continue his belief in communism throughout his life locating in England in his final years.